I love to crochet and knit so it is a joy to see an artisan like Liliana's work on Nonna Lia. 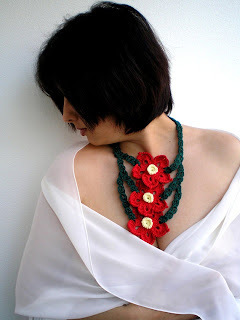 She is an Italian expert who makes all sorts of beautiful natural yarn creations. Naturally, the pieces which intrigued me most were her necklaces! Her soft and non-metallic necklaces will definitely be a boon for those who are allergic to metals. The designs are trendy especially the black cotton Dark Lady set shown above. 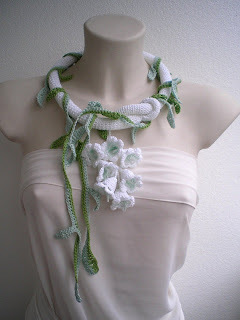 She makes full use of yarn colors for bold statement designs such as the Purple Leaf necklace below. All her designs are beautifully modeled and photographed. The use of plain white garments certainly helps accentuate the striking designs. Liliana is also capable of making delightful whimsical pieces. Her rope necklace design is certainly bold in color and form. An inspirational designer indeed! UPDATE : Liliana is offering a 10% discount for readers of this blog. Just enter this code PEARL10!